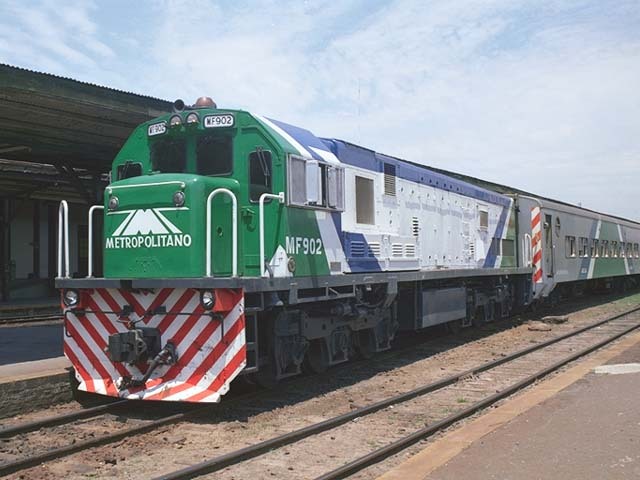 Currently the new GE's work all the Ferrosur lines, but in the future they will work mainly from Olavarria to the new cement plant of "Loma Negra" (owner of Ferrosur Roca) at Vicente Casares (around 55/60 kms from Buenos Aires). They haul, mainly, stone and cement. 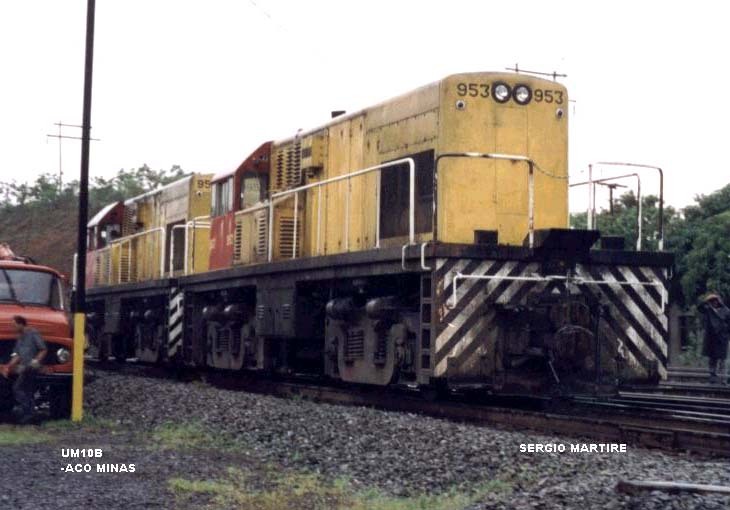 Belgrano Railway, Shovel Noses 5702 and 5734 are seen in "double traction" at Saldias yards, just outside Retiro General Belgrano station. 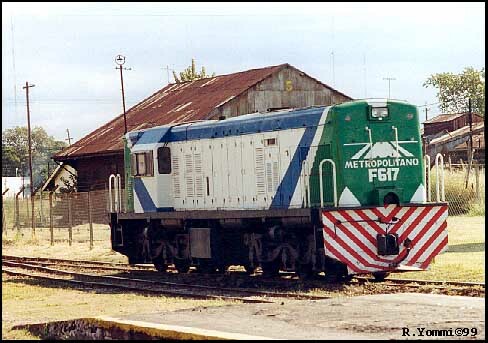 Belgrano Railway “Shovel Nose” 5725 is seen beside the small depot at Saldias just outside Retiro terminus station. 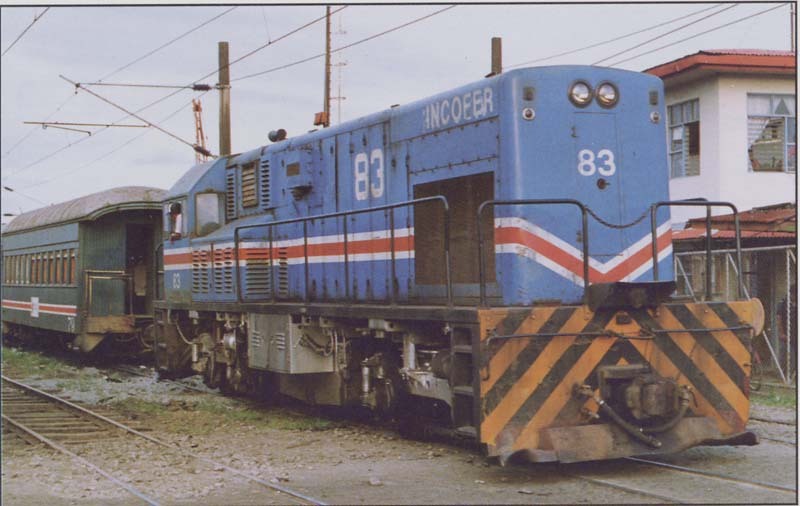 Now a double-ended Loco, this was a rebuild from two single ended units! 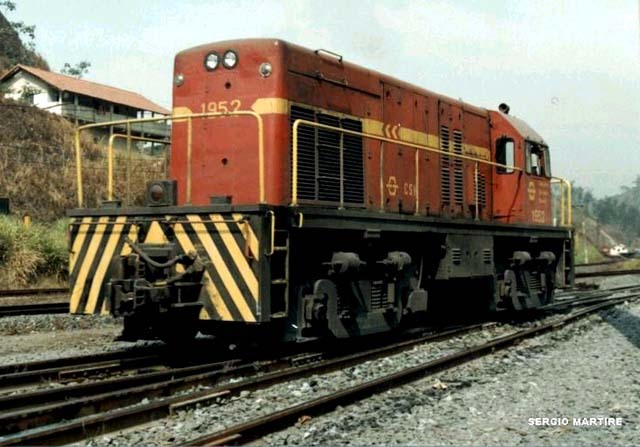 Fitted with a GE engine, unlike others that have an ALCO engine. November 9 1999. 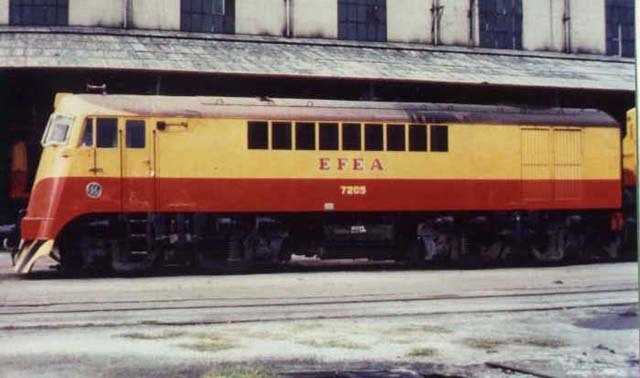 A depot full of G.E. 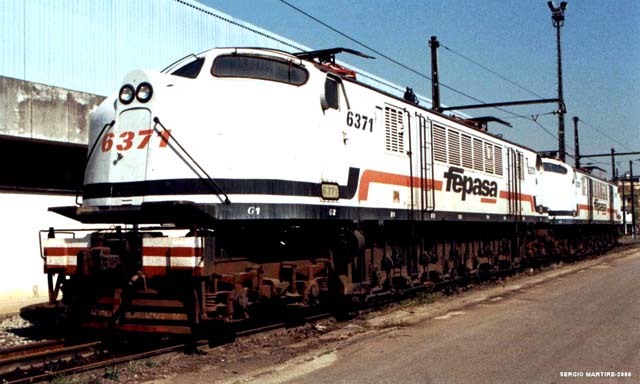 V8 electric locomotives, with the first FEPASA livery, at the Campinas station. 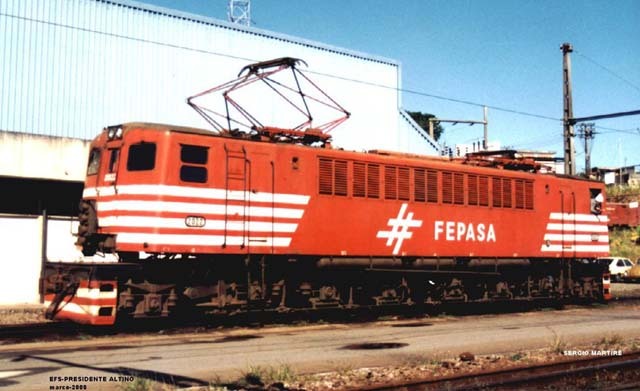 A FEPASA worker is by the side of the #6379 locomotive. This photo was shot by Cid José Beraldo, in January 25, 1977. 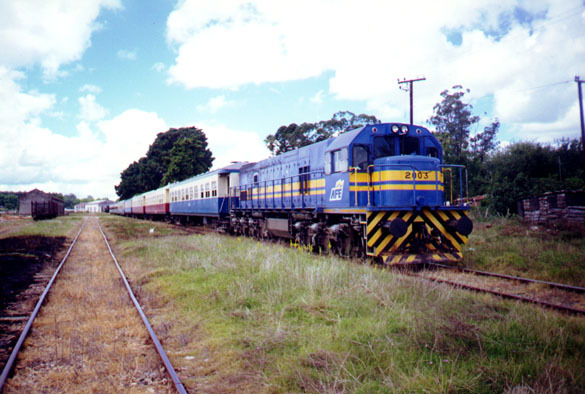 A passenger train in Jundiaí being pulled by a Vanderléia (6355) with the first FEPASA livery. 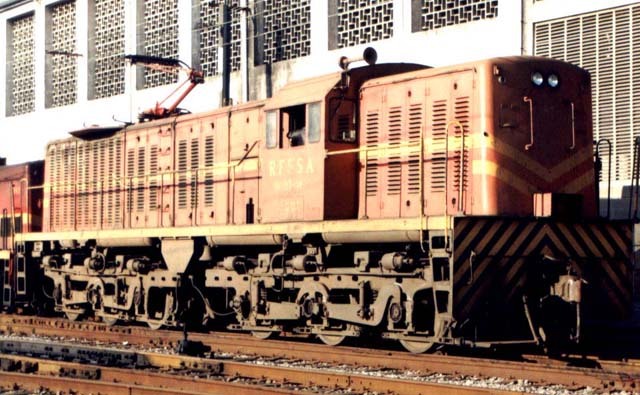 Note that the locomotive is somewhat dirty; this would be considered a terrible sacrilege during the golden age of Companhia Paulista. Photo by Ivanir Barbosa, from Jundiaí SP, in June 1977. 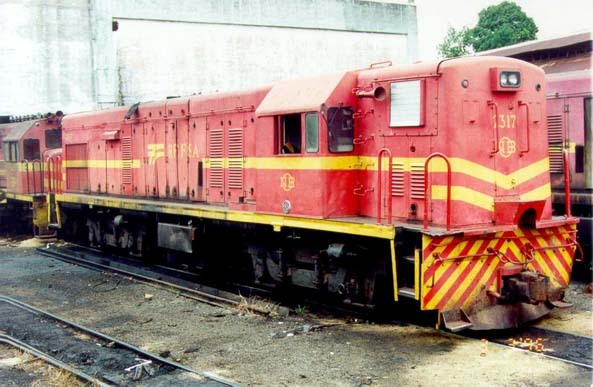 Former CB No 2151-bd#34360-9/62 C-C ,gauge 1.600mm.Photo taken in 1992 in Sao Paulo, Luz depot -All locos of this class were scrapped. 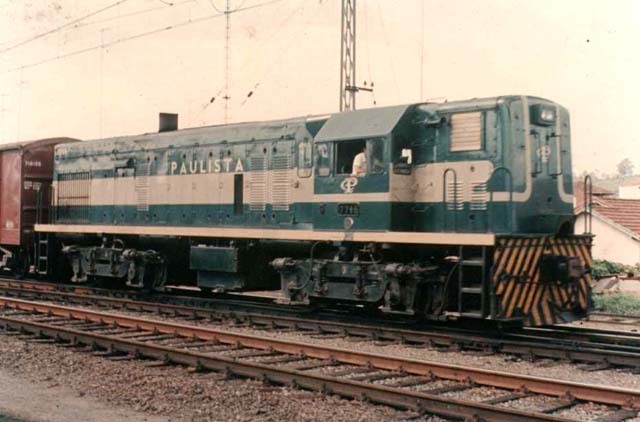 U9B 745, one of ten such Locos built late 1958 for Cia Paulista. Photo by Ivanir Barbosa. 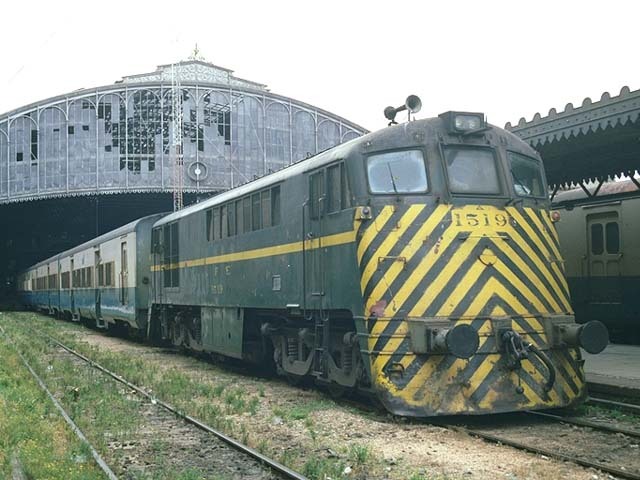 Cia Siderurgicia National, UM10B number 1952 built in 1961 in a batch of four Locos. Seen in red livery. Near the depot in Volta Redonda-RJ. 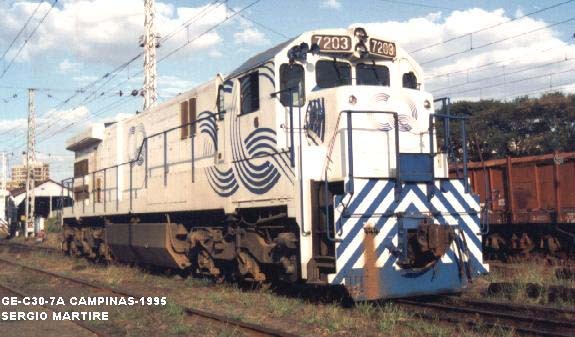 A General Electric U12B diesel-electric locomotive 2317 with the RFFSA livery, but still keeping the old NOB logo. 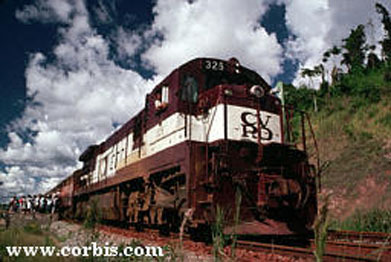 Photo shot by Eduardo Prevedello Bento, from São Paulo SP, in March 3, 1996. 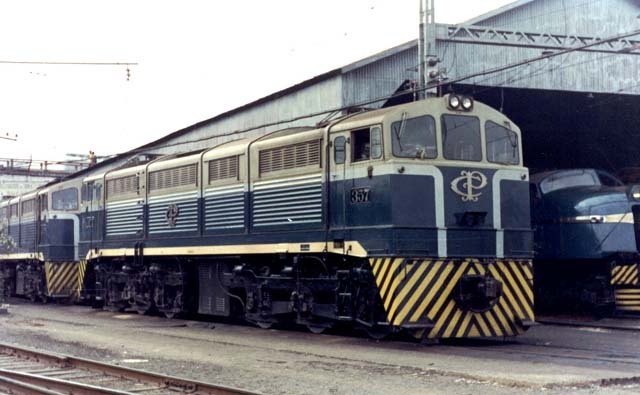 U20C 3862 is seen brand new in May 1975, in the dark blue Fepasa livery. Picture by Cid J Beraldo. 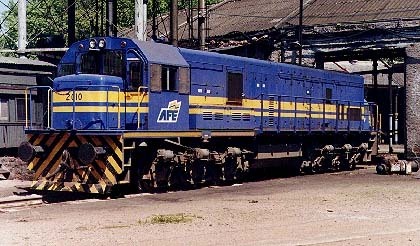 A fuel train pulled by three G.E. 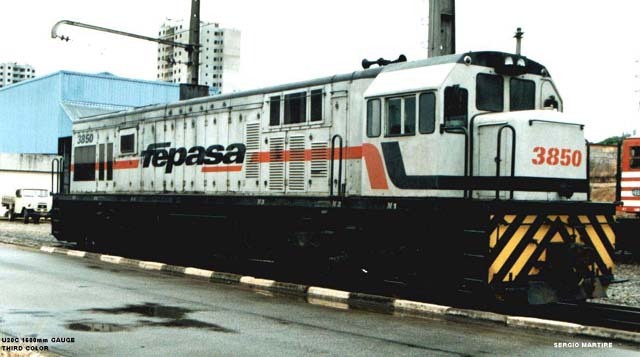 U20 locomotives; the front and rear machines are from Novoeste, while the one located in the middle is from the former FEPASA. Photo probably shot in the Bauru N.O.B. switchyards, by Nílton José Gallo, from Bauru SP. 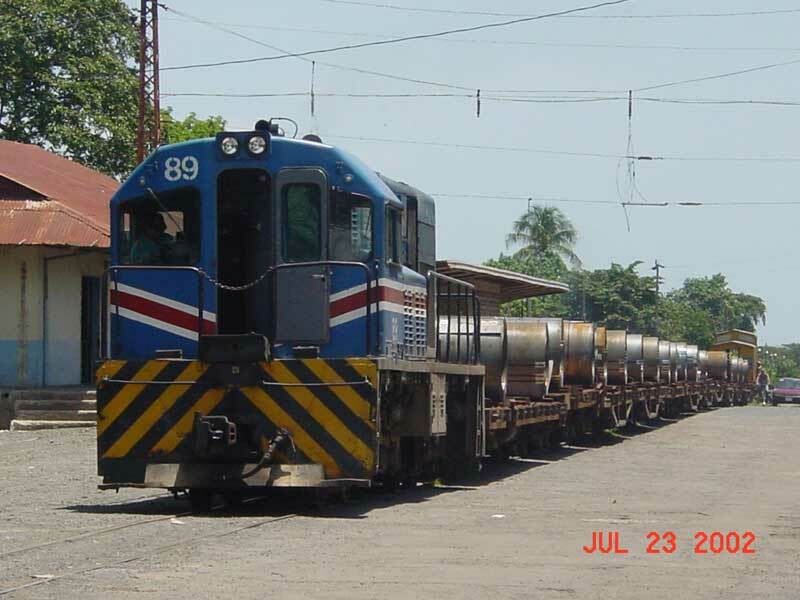 Ferrovia Centro-Atlântica S/A has 7.080 Km of line covering the states of Sergipe, Bahia, Goiás, Espírito Santo, Rio de Janeiro, Minas Gerais and Distrito Federal. 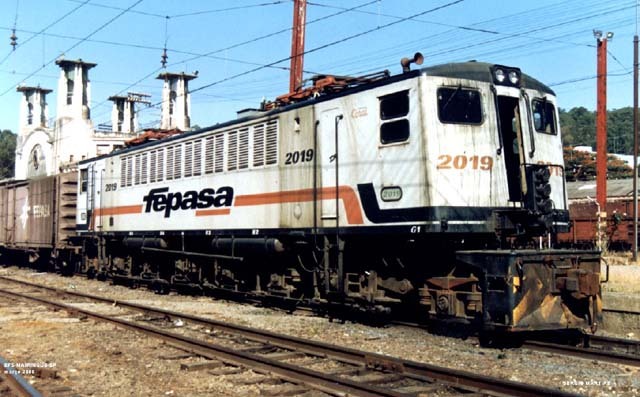 FCA is linked to the main Brazilian railways and to important sea and river ports, with a direct access to the Ports of Salvador (BA), Aratu (BA), Vitória (ES) and Angra dos Reis (RJ), in addition to those of Pirapora (MG) and Juazeiro (BA) in São Francisco River. 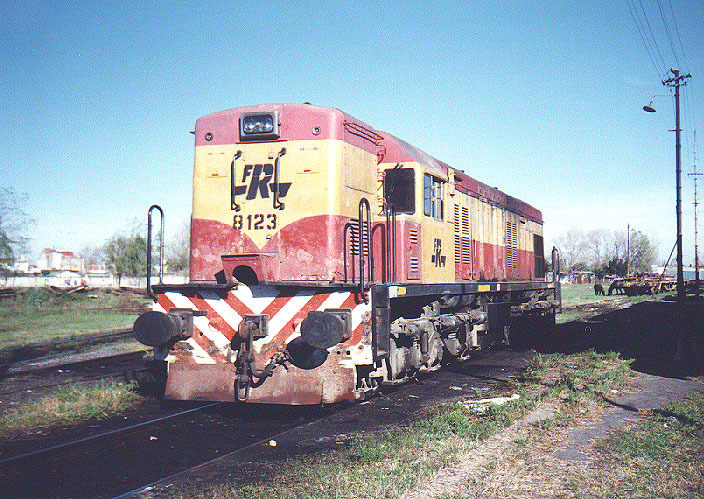 MRS U23 3315 in "Logistica" livery and RFFSA U23 3382 seen in red livery. 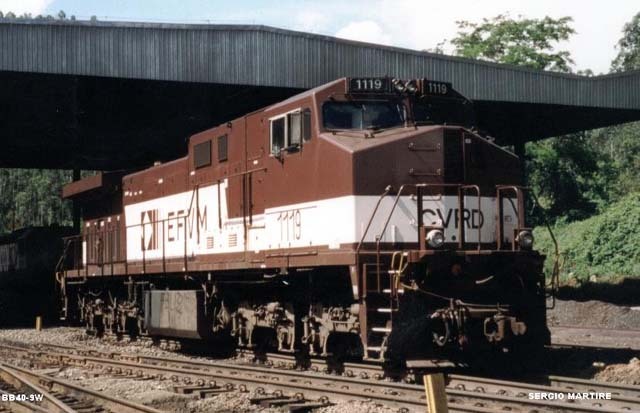 REDE received some U23's from GE US and some ones from GE Brasil- In the 90's REDE decided to change the red color for a new one - gray and yellow or yellow gray ,and painted a number of locos all over Brasil, from north to south, since red was the official color. 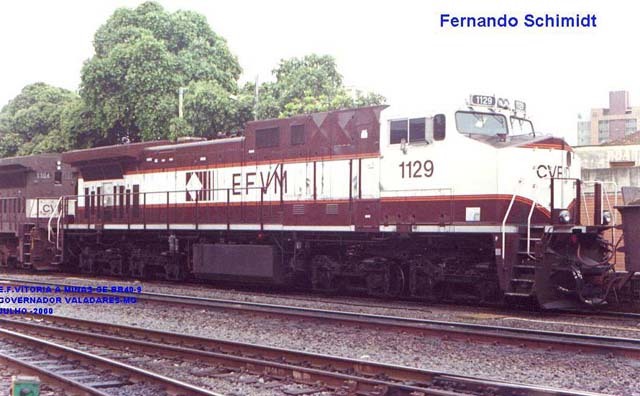 Some railroads painted in red but with the old names of the railroad, (see the U12 at Bauru marked NOB and U6B marked Central). Upon sale the new owners changed in some cases the colours. 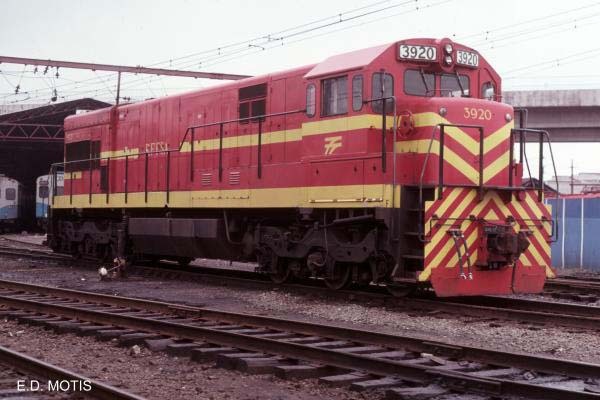 So the U23C had the following colours, Red for Rede Ferroviaria Federal, grey and yellow for Rede and blue and yellow for MRS Logistica. 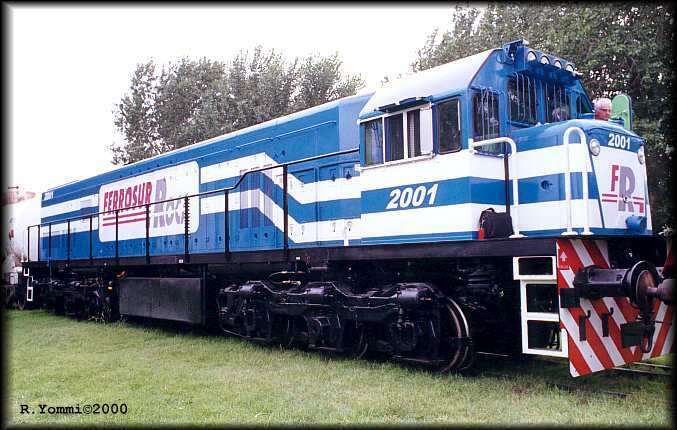 A brand new 4400 HP General Electric Dash-9-44CW-M diesel-electric locomotive, #803, with the new E.F. Carajás livery. 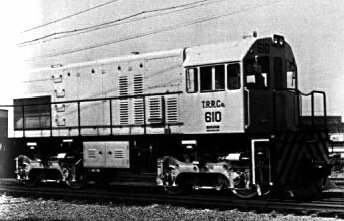 Photo originally published at the General Electric locomotive catalogs; copy courtesy of Hermes Yoiti Hinuy, from São Paulo SP. 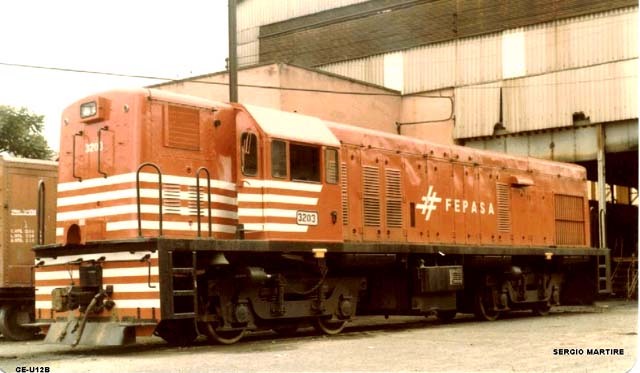 The Carajas C30-7 were ordered and numbered from 300 to 341. 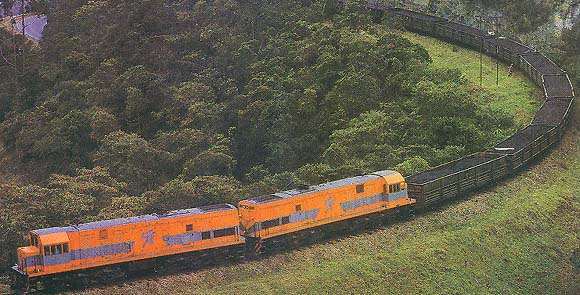 A passenger train in the rain forest, at the Pará state, north of Brasil. Due to the lack of highways in this region, passenger transportation is quite a success! 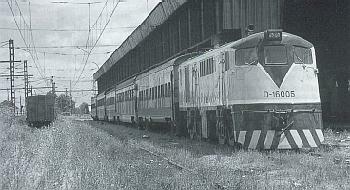 Photo originally published at Revista Ferroviária. 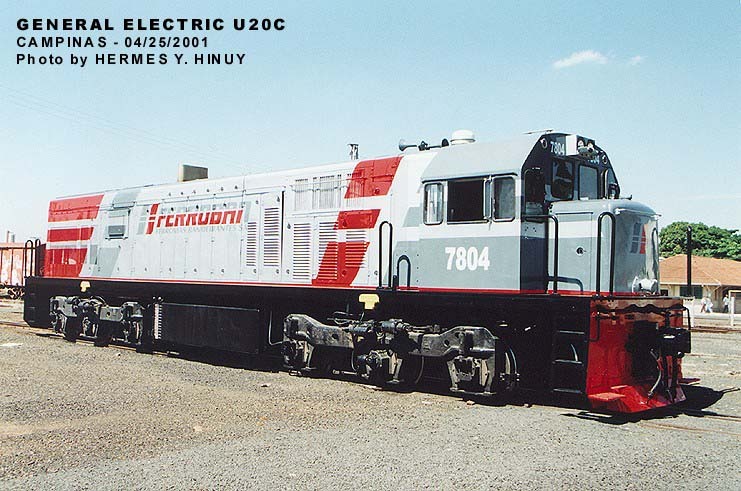 Picture of EVFM U26C 406, four of the original six have since since been sold to Ferronorte. Photo by Hermes Yoiti Hinuy. 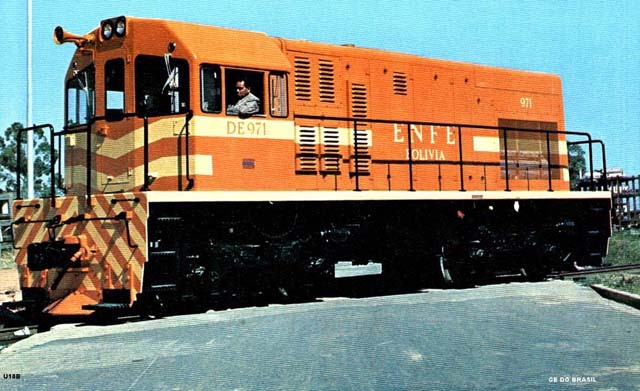 A second hand U26 diesel-electric locomotive of FerroNorte, #703, bought from EFVM. 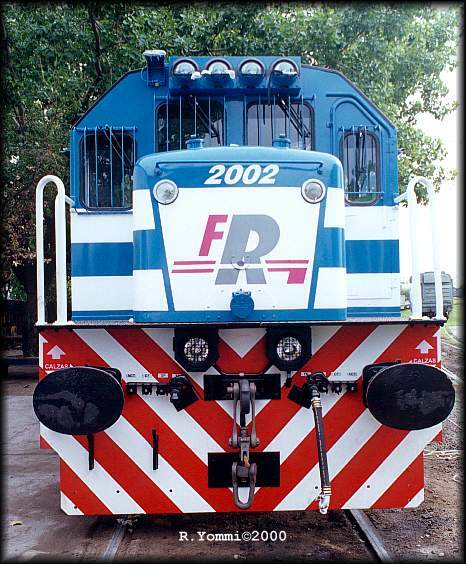 In 1998 four were sold to FerroNorte, which was just starting its operations. 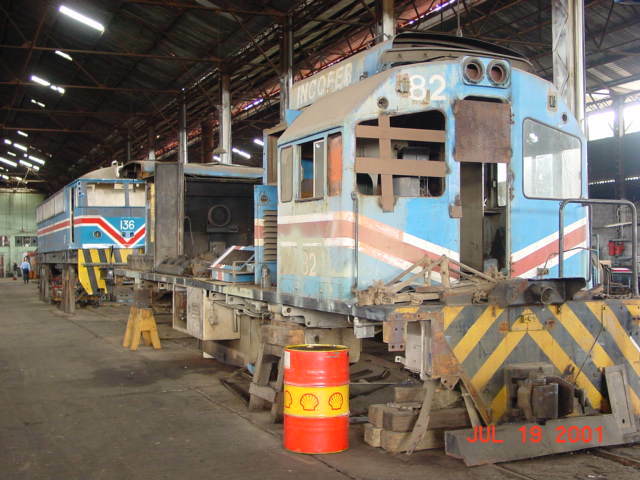 So they needed to be converted for use in broad gauge. 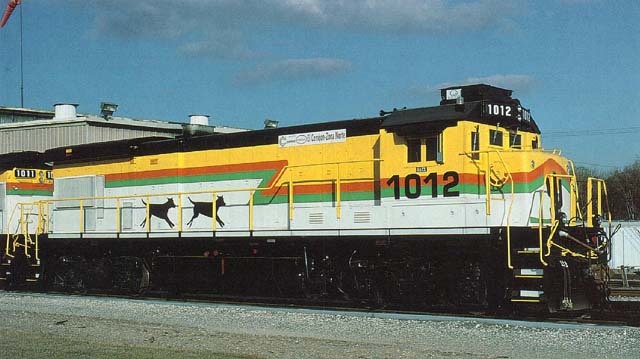 The locomotive still kept its original livery only the badge was changed. 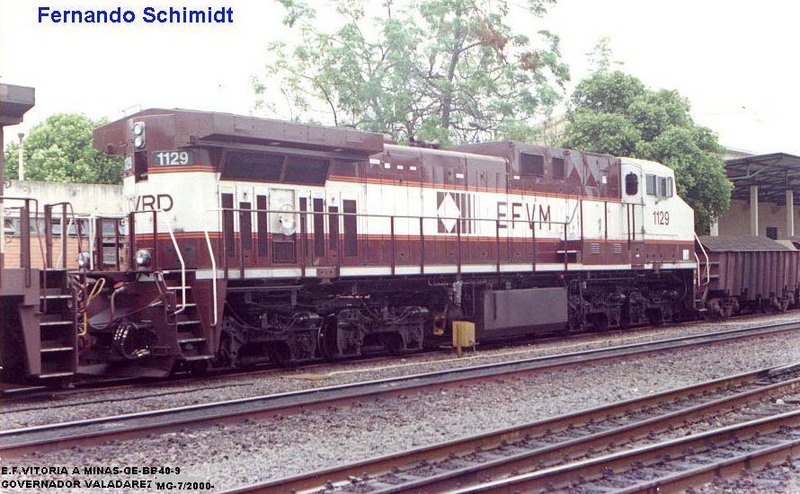 Photo taken at the Triagem Paulista station by Ricardo Frontera, in June 1999. 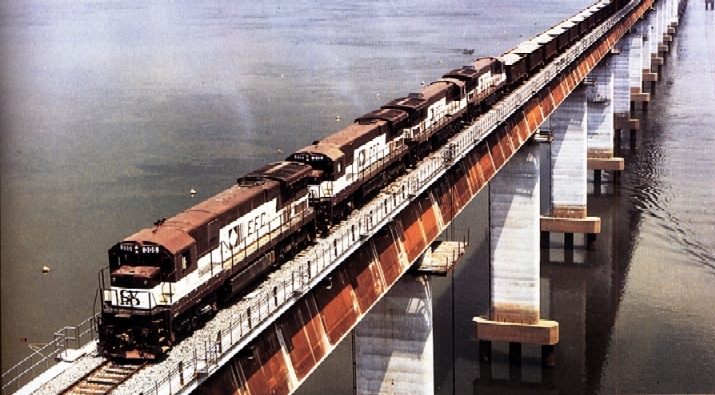 A train of an ore train crossing the E.F. Carajás bridge over the Tocantins river. Photo supplied by Usiminas Mecânica, the company that built the steel structure of this bridge. 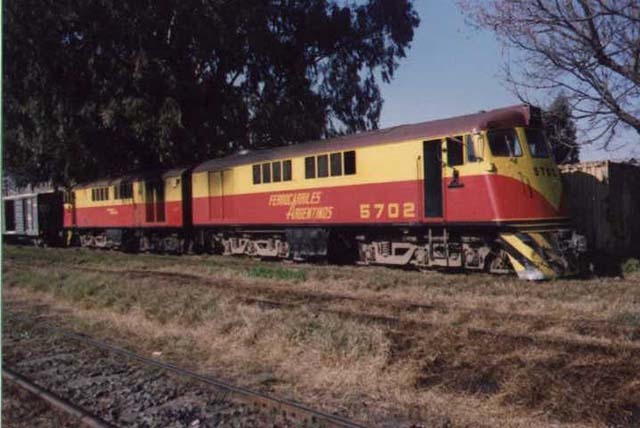 Chilean "Shovel Nose" D16005 (ex D7005) is seen at Temuco with a train bound for Santiago. Photo by Hermann Neidhart in Fern Express magazine 59. 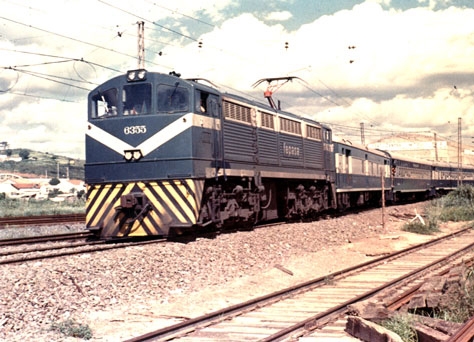 U20C 605 is one of ten U20C's, narrow gauge of 914m built in 1964. 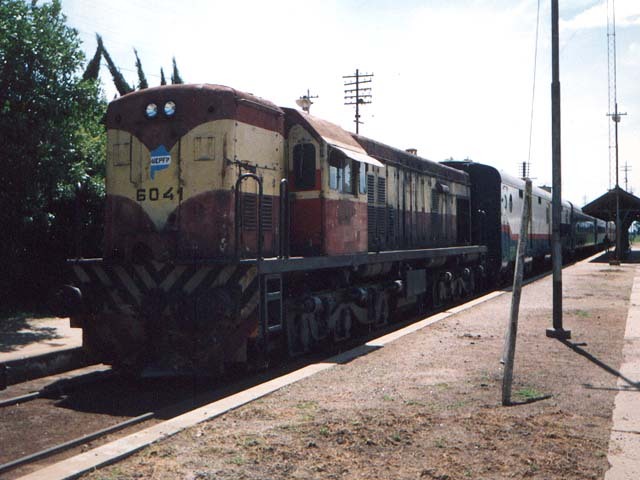 U10B number 0963, one of twenty eight U10B's built by Babcock & Wilcox (Spain) in 1973. 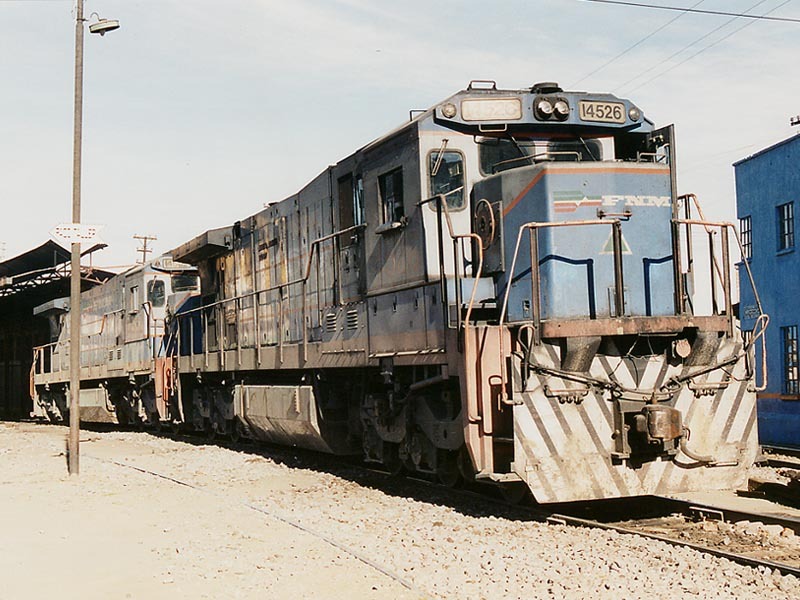 A pair of U18C's built in 1984 are seen on a freight train. 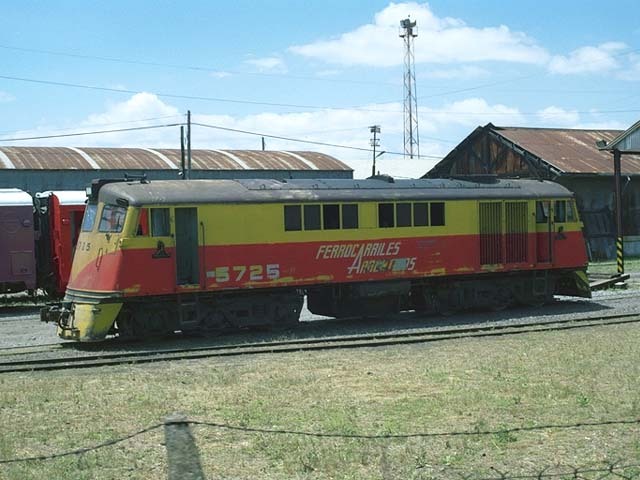 Public rail services are operated by Sociedad Colombiana de Transporte Ferroviario SA (STF), which took over operations in 1992 when FNC ceased to run rail services. 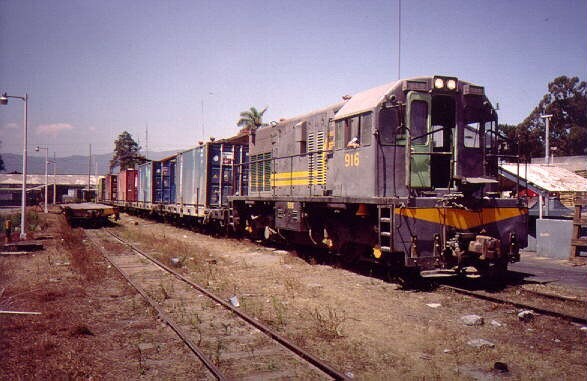 It handles large volumes of goods, both for import and export. 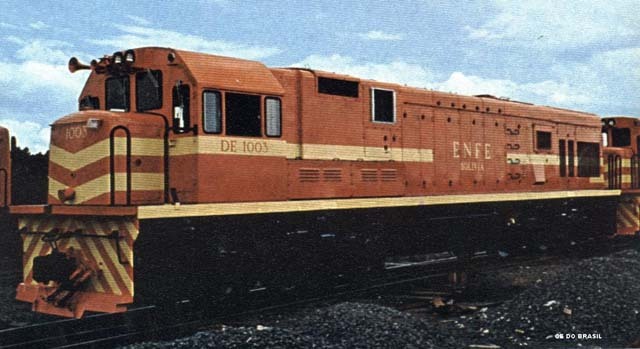 1002, one of the four B36-7's supplied new to the Cerrejon Coal Project in mid 1983. 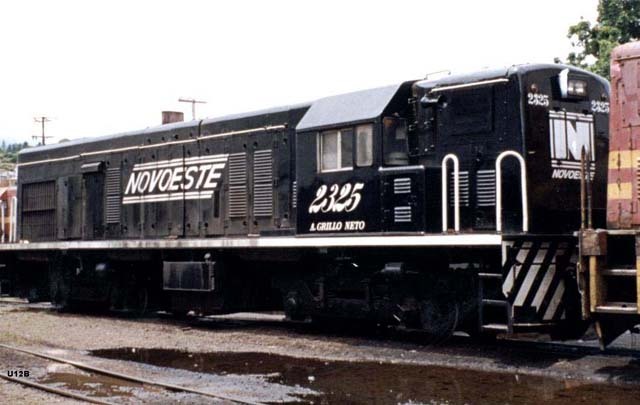 Numbered as 1001-1004 (builders numbers 43294-43297). 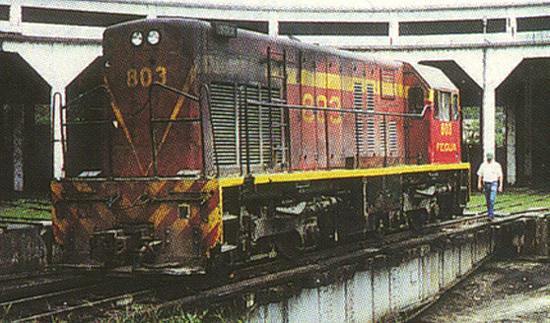 Locos are fitted with 7-FDL-16 of 3980hp. 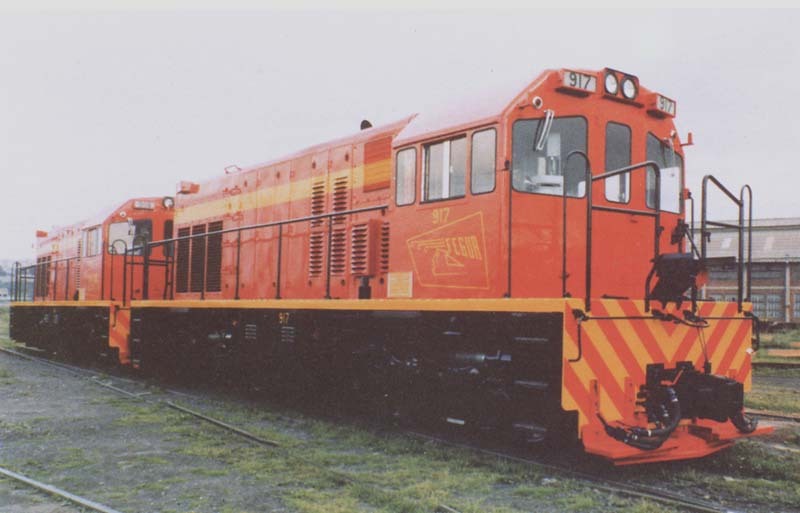 Standard 1.435m gauge, B-B. GE photo. 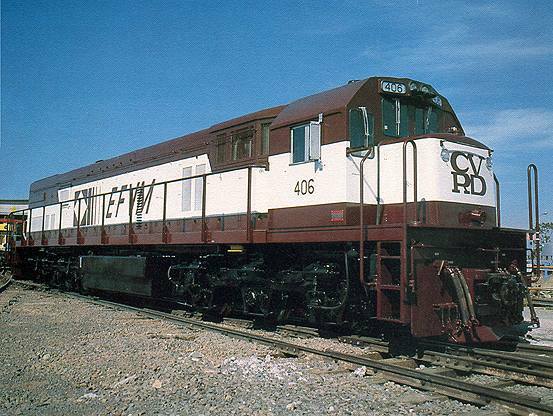 1007, one of second batch of four C36-7's supplied new in 1984. 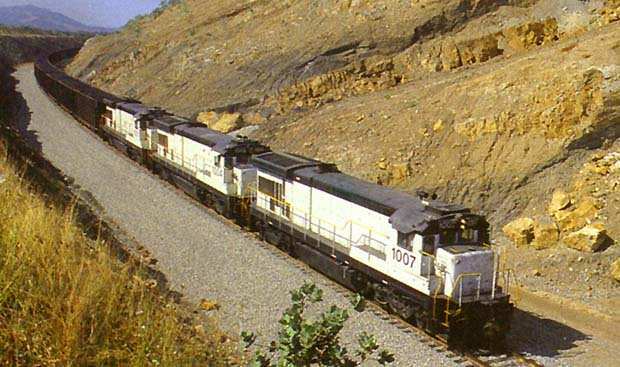 The "Carbocol" line is 150 km long, from the Cerrejón coal mine in the Guajira peninsula, the northern tip of Colombia, to Puerto Bolívar (formerly called Portete). 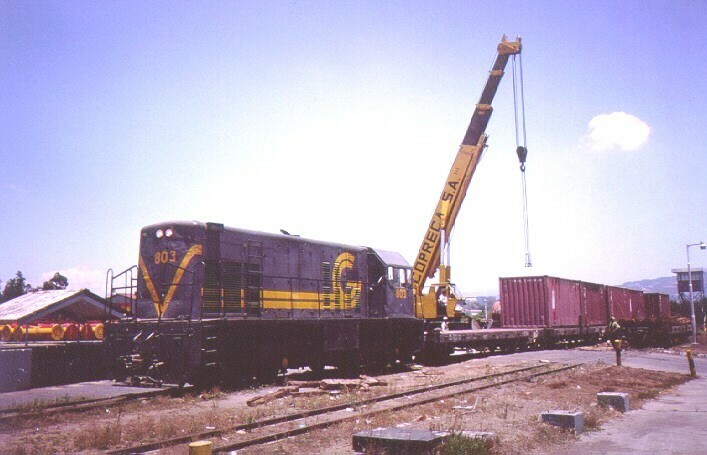 It carries coal for export exclusively, two 120 car sets are used. 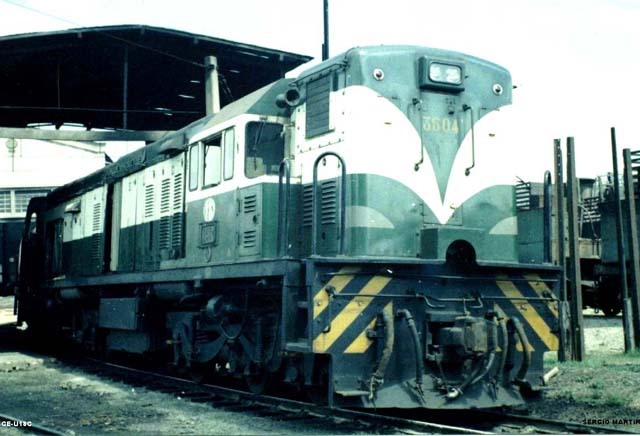 The line has been in operation since 1986, generally four trains a day run. 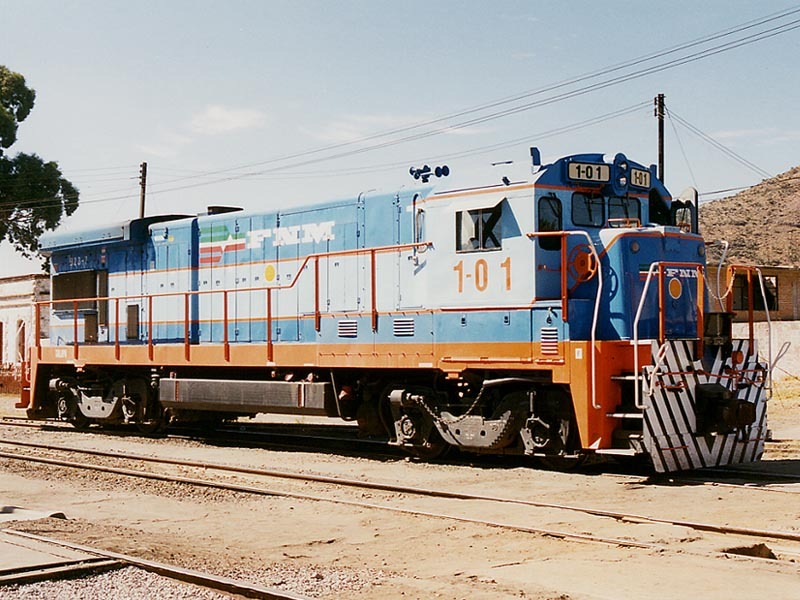 1012 (and 1011) are seen at Houston, Texas en route to Colombia. 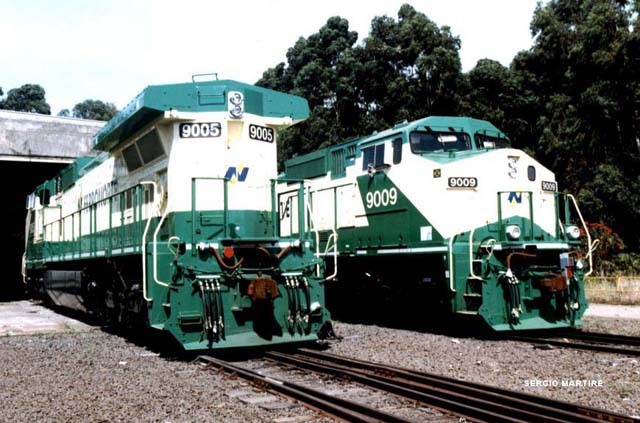 Both are ex Norfolk Southern C36-7's overhauled in the US. Note the bullet proof glass and small windows, due to rebel activity in the area where the trains run. Photo by Robert Pierce, from X2200 South magazine. 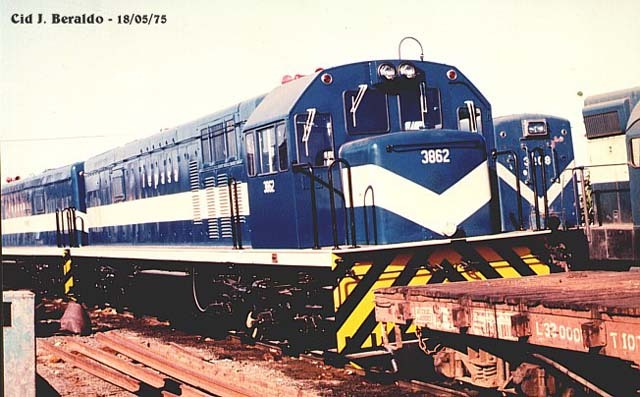 83, one of 10 US built U11B's built in 1979. 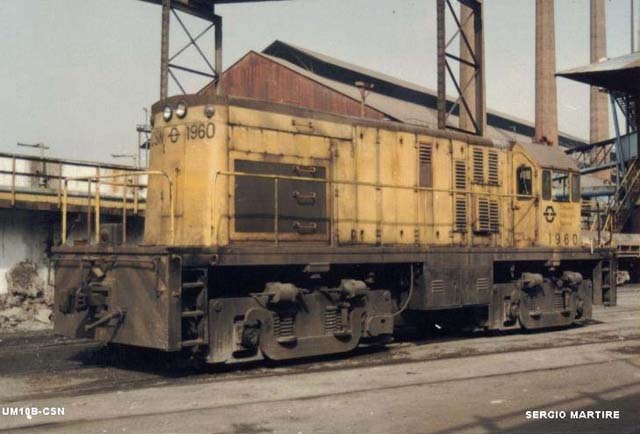 Fitted with the Caterpillar D398 engine of 1100hp. Narrow gauge,1.067m. 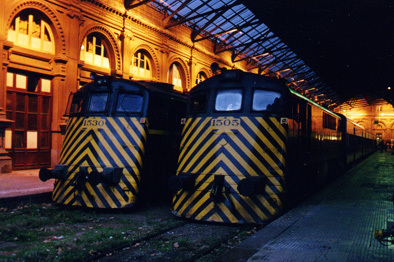 Photo from Locomotoras Diesel (II). 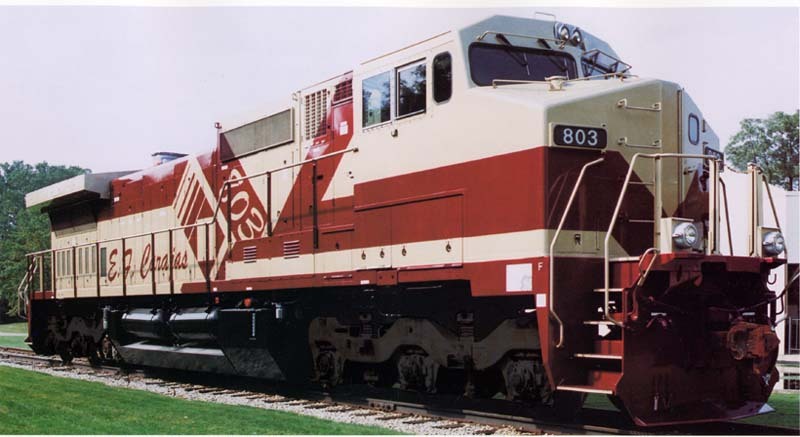 803, one of two U8B Locomotives built in 1960. This was found to be in relatively good condition, having seen little use as traffic declined before closure. And is likely to still be in use. 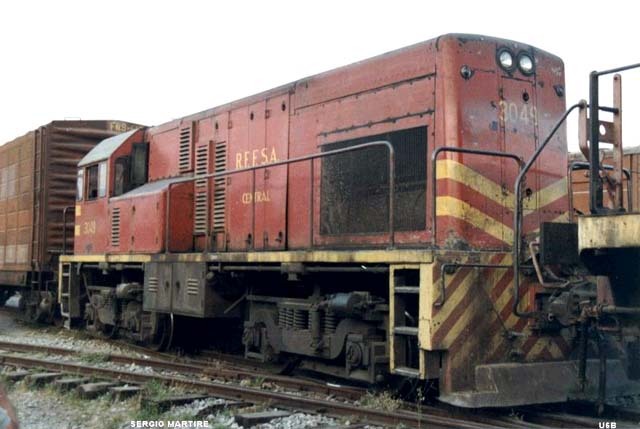 Operations now have been awarded to the Compania Desarrolladora Ferroviaria SA, to restore rail operations. 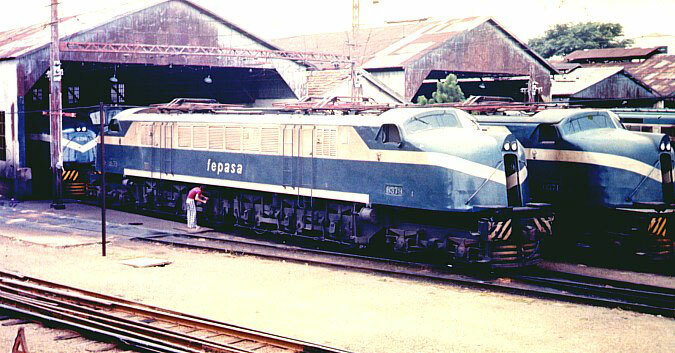 917, one of 18 Spanish built U10B's built in 1971. 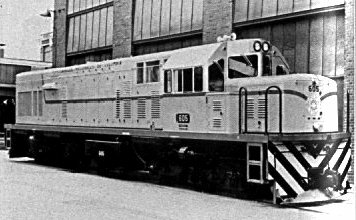 Fitted with the Caterpillar D398 engine of 1050hp. Narrow gauge,914mm. 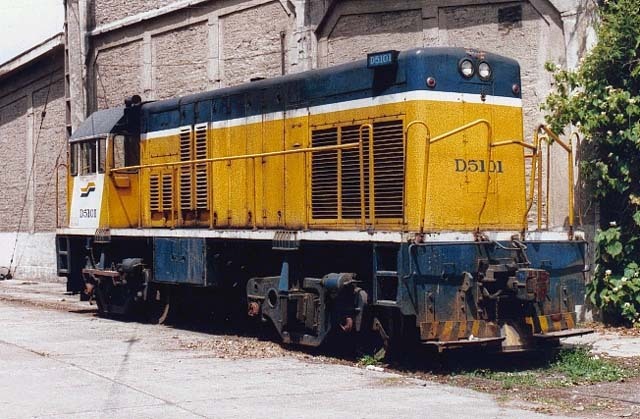 Photo from Locomotoras Diesel (II). United Fruit Co 610 is one twelve U6B's of 1.067m gauge built in 1967. 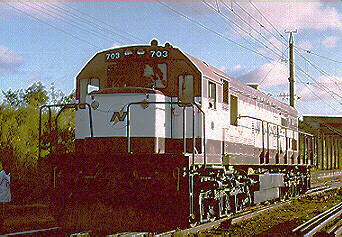 B23-7 1-01 in ex works condition at Oriental on 27 November 1996. 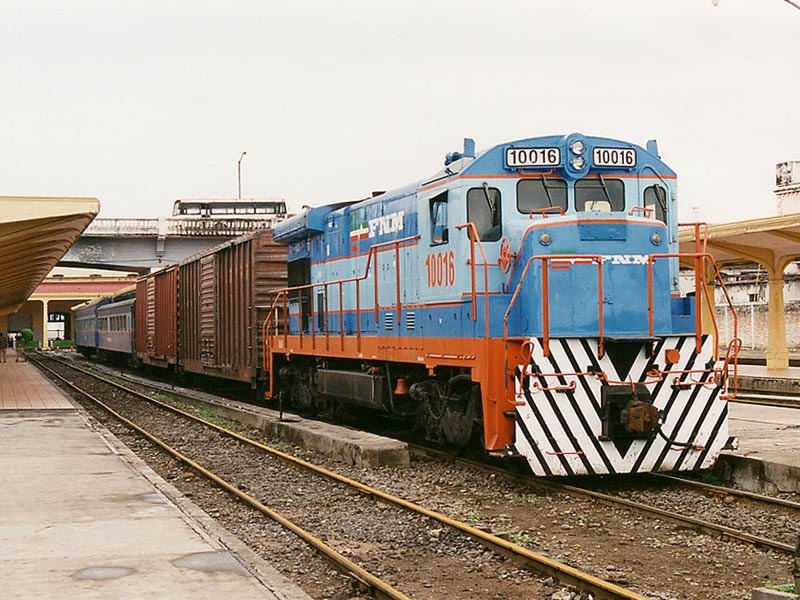 A small batch of eight Locos in this special number series, built for "Servicio Multimodal Transistmico" (a dedicated intermodal service) between Coatzacoalcos - Salina Cruz (across the Isthmus of Mexico). However the service never ran. 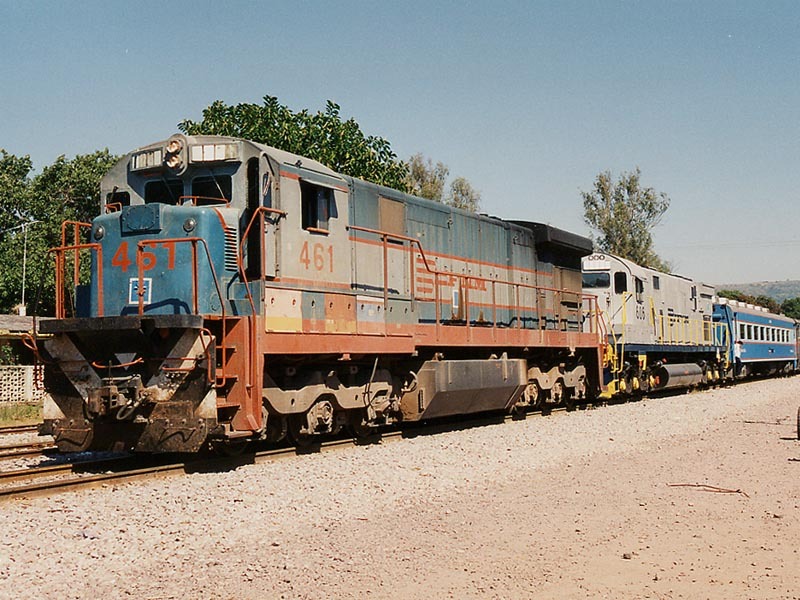 FNM C30-7 461 on northbound express from Guadalajara to Nogales is seen at Costilla. 18 November 1996. 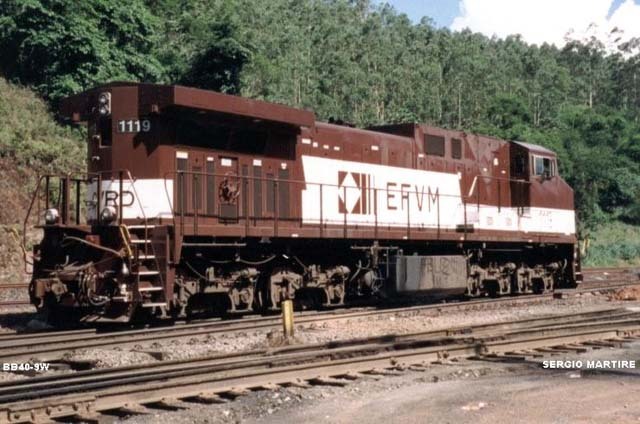 Originally built (or intended to be built) as FNM 11333. The 460-463 batch coming from the 11132-11335 batch of orders. 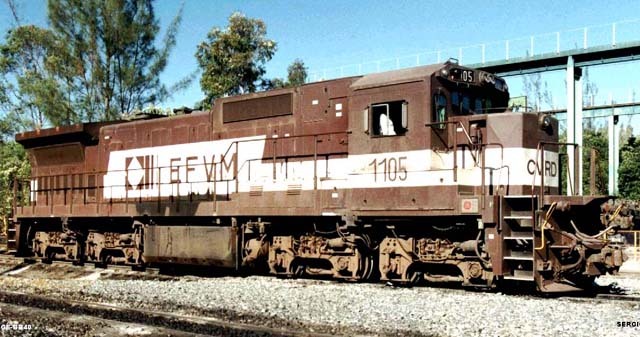 FNM 14011 is seen at Ahuacaltan about one hundred miles into its long northbound journey with train 3 from Guadalajara - Nogales. 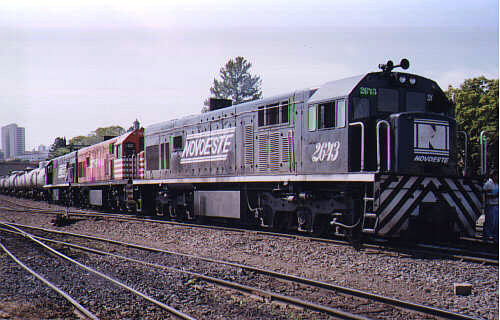 Rebuilt from U30C Locos in Mexico, upgraded to Dash-7 standard. 17 November 1996. 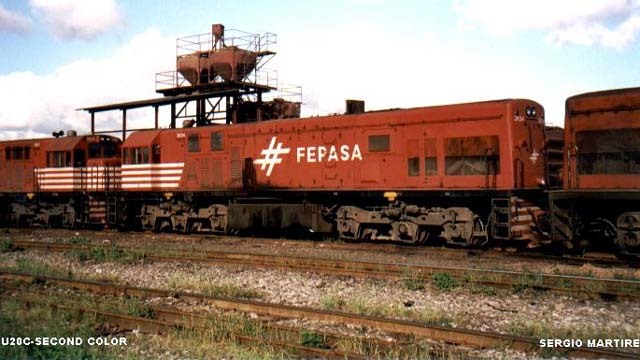 Super 7 14526 is parked at Apizaco with another Loco. 29 November 1996. 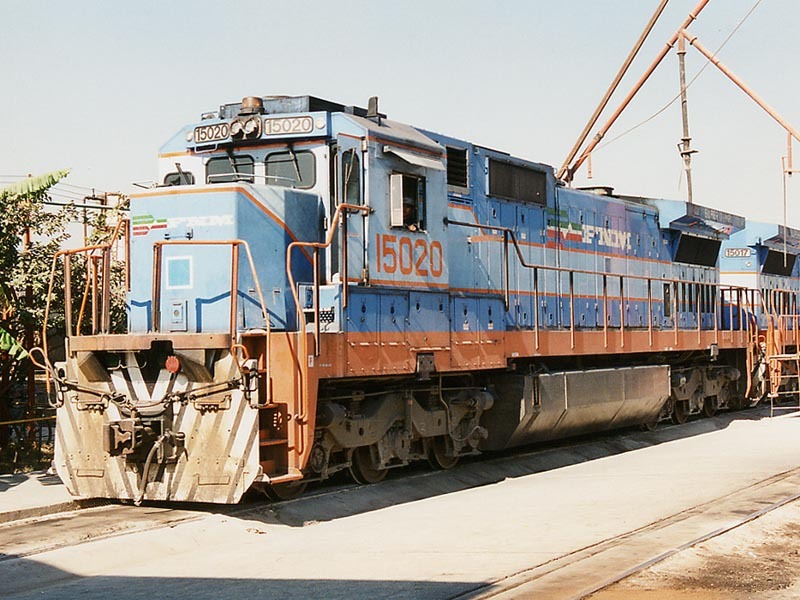 FNM General Electric designed Super-7MP 15020 is seen on the fuel racks at Guadalajara depot in the early morning sunshine. 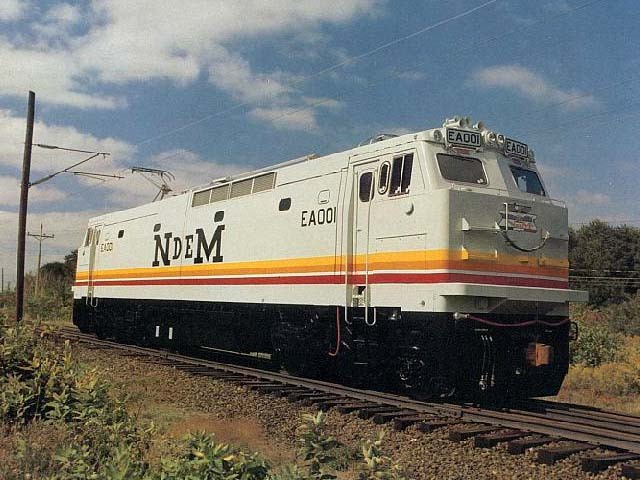 The FNM have 34 of these new Loco's, built in 1994. 17 February 1996. 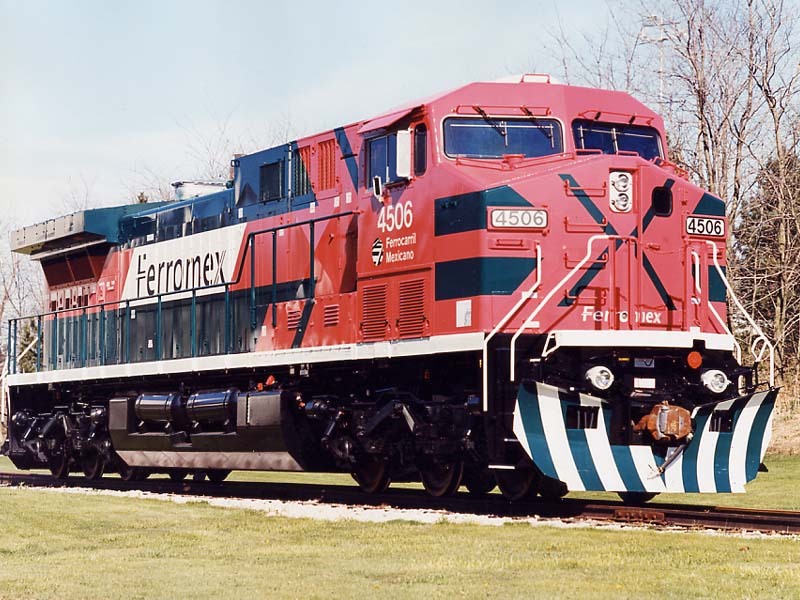 Ferromex 4506, an AC4400CW built in 1999. 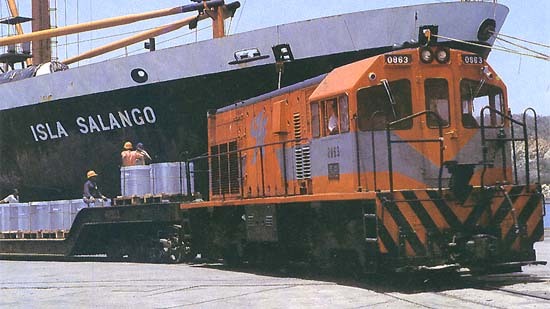 Locos are used mainly on Iron Ore (taconite) trains between Manzanillo, Colima and Felipe Pescador. 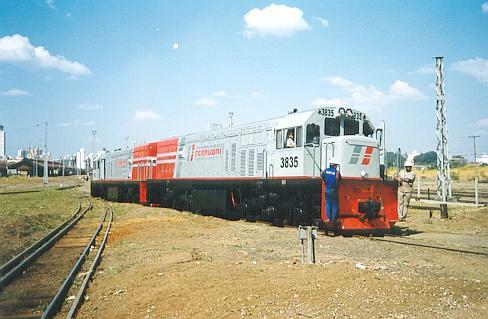 Maintained by GE at San Luis Potosi, SLP shops. 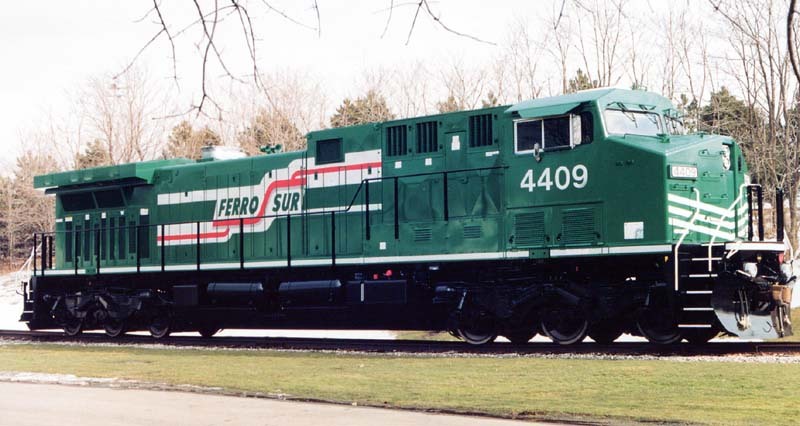 Ferrosur C44-9 4409, GE factory picture. 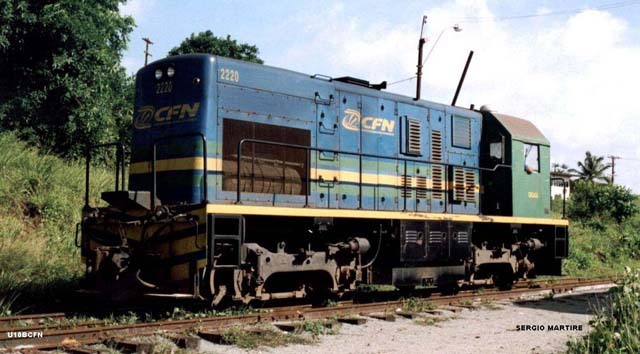 TFM 2602, an AC4400CW built in 1998. 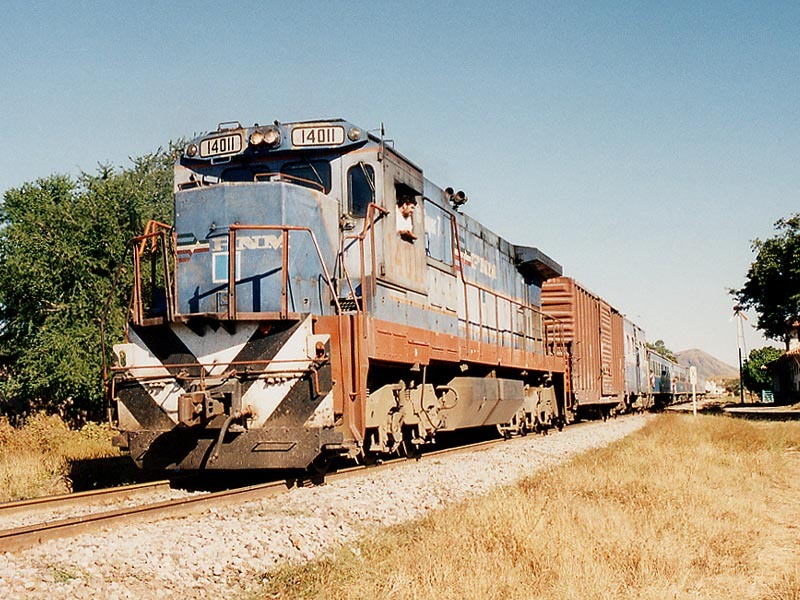 Locos work between Nuevo Laredo, TAMPS and Mexico City. 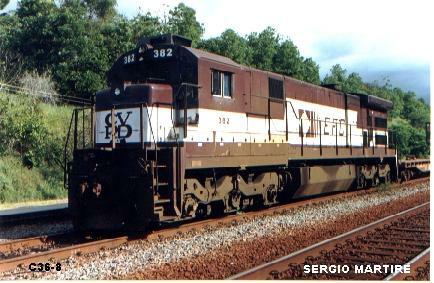 Maintained by GE at San Luis Potosi, SLP shops. 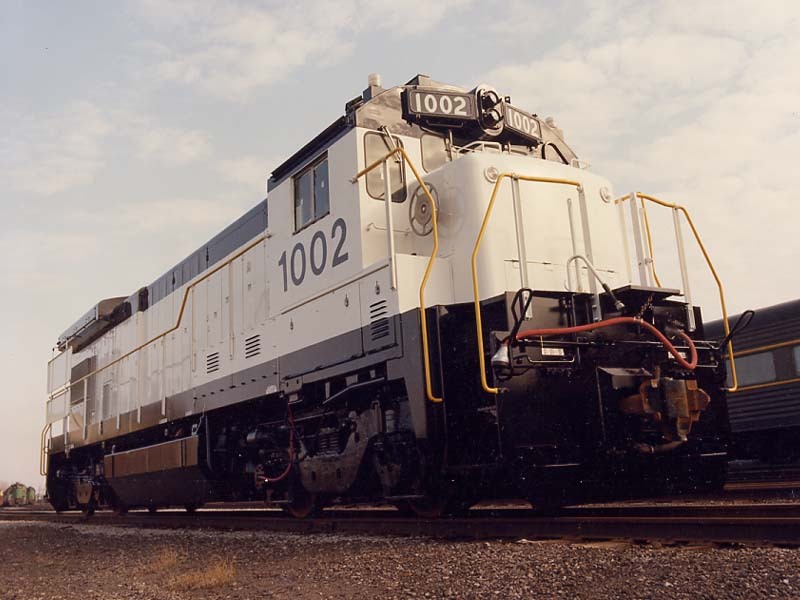 The 39 E60C Electrics (EA001-EA039) of 6000hp were built in 1982/3, and it was not until mid 1990's that they actually entered service. 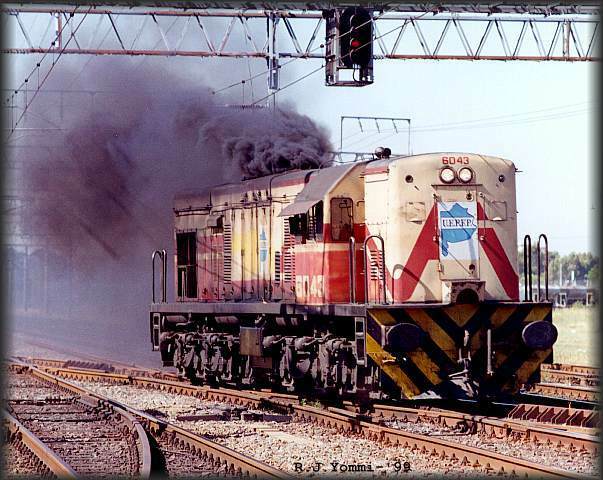 Only working for a few years, before new companies taking over freight services preferred new Diesels. 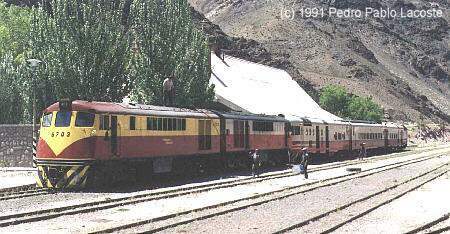 Ferrocarril del Pacifico U10B number 5, narrow 1.067m gauge, on of six built in 1964. 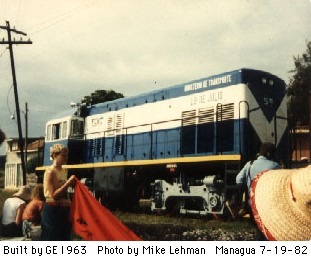 Pictured at Managua by Mike Lehman in 1982. 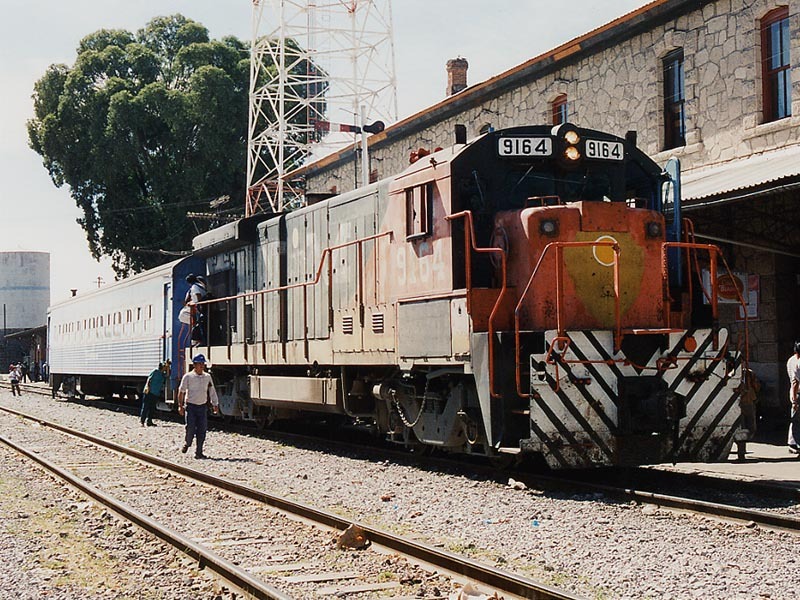 52, one of 10 U23B's supplied to Peru Southern Copper. 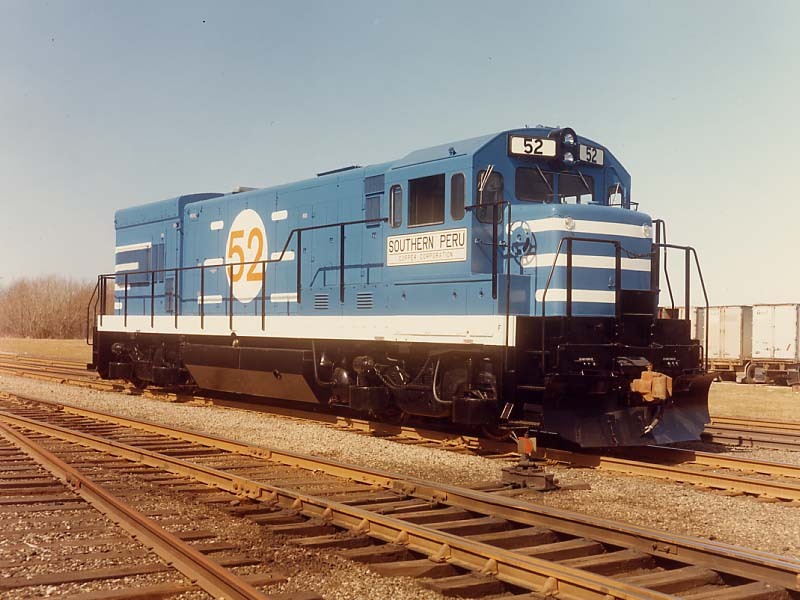 Numbered as 50-59 (builders numbers 40362 - 40371. Fitted with a 7-FDL-12 engine of 2490hp. 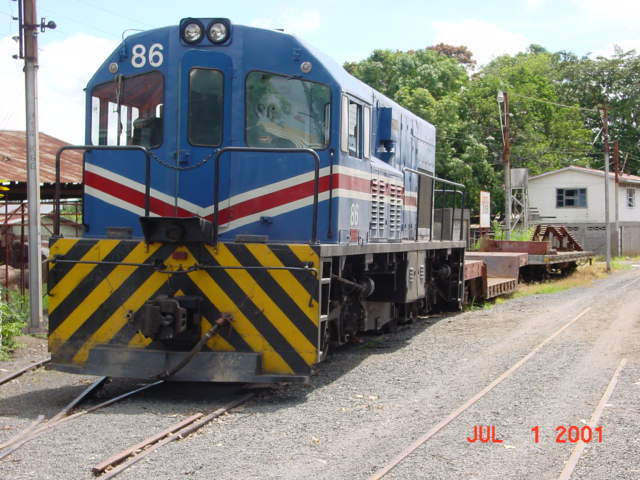 Standard gauge B-B, built 5-11/75. GE photo. 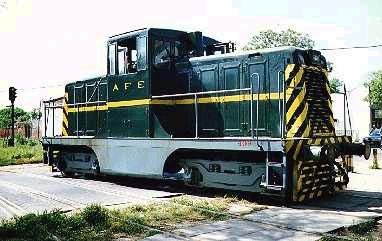 AFE 1519 “shovel Nose” Loco at Montevideo on train 1205, the 18.00 departure to 25 de Agosto. 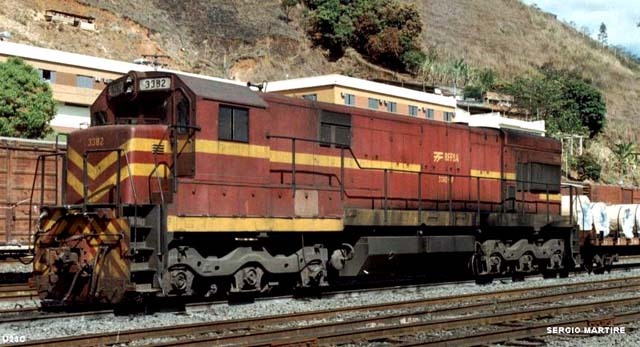 One of about ten Locos still in use, out of the original batch of forty-seven supplied from 1952-55. 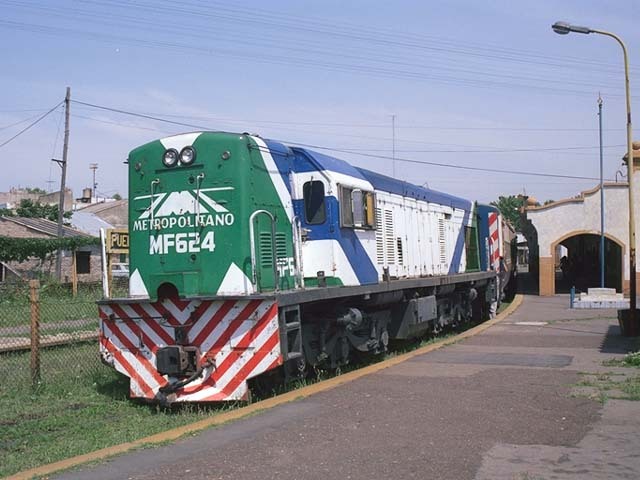 Currently normally at least one Loco can be found on commuter trains from Montevideo to 25 de Agosto, a two hour journey for the 64 kilometres. 2 November 1999.